Dr. Philip Philip helped shape the career of Winship's Gastrointestinal (GI) Oncology Program Director, Dr. Bassel El-Rayes. 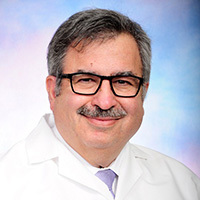 Long before he became the director of Winship Cancer Institute's Gastrointestinal (GI) Oncology Program, Bassel El-Rayes, MD thought he would be a hematologist and bone marrow transplant specialist. He changed direction after his first meeting with his mentor, Philip Philip, MD, PhD, a medical oncologist at Karmanos Cancer Institute at Wayne State University in Detroit. "Philip's passion for academics, high ethical standards, and witty sense of humor inspired me to rethink my career choice and change my research focus to GI malignancies and pancreatic cancer," says El-Rayes, who also serves as Winship's associate director for clinical research. El-Rayes credits Philip with shaping his career path as a translational researcher. "Philip taught me many things, but most importantly, he told me to always put patients first. Research was the means to improve a patient's outcome; therefore, the starting point of any research project has to be 'how will the results of this work impact patient care and outcomes?'" 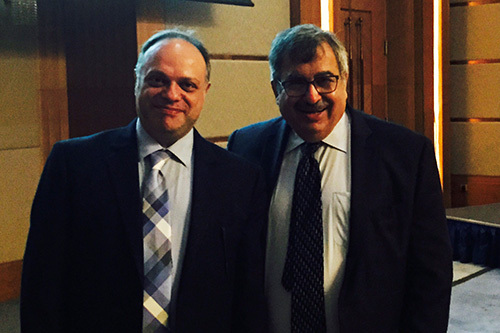 Bassel El-Rayes, MD, with Philip Philip, MD (right).